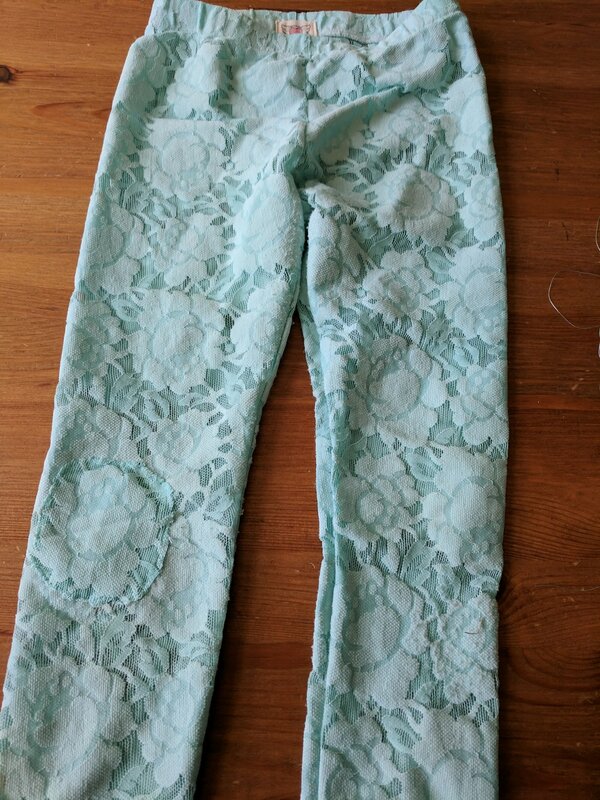 Today I spent a few minutes mending a pair of our Lacy Leggings for a friend. As kids will do, she had worn a hole through the knee of her leggings. I decided to not just put a matching patch, but to reinforce the patch from the inside with an extra scrap of plain jersey. This way, the patch will be a bit thicker, and stronger since this lace fabric is pretty delicate in places. I cut the patches roughly the same size as each other, but about an inch larger than the hole on all sides. Starting on the inside of the leggings (it's a bit awkward, but stick your hand through the leg, there's no other way) place the plain jersey patch over the hole. You can pin it in place if that helps, I went without. Using a small whip stitch, or overcast stitch sew around the edge of the patch. Make sure you are getting as much contact with the non-mesh portion of the lace as you can. DO NOT pull the thread very tight. The knee of the garment needs to stretch, and if you pull the thread very tight, it will not be able to withstand the stretch of the fabric. It needs to have a little give, but not be loose. More stitches per inch can help with stretchability. You can test this by giving little tugs along your stitch line as you go. If it feels like the thread might break under too much tension, then it's too tight. Once the inside layer of the patch is sewn, turn the leggings right side out and place the matching lace patch over the hole on the outside, lining it up as well as you can with the inner patch. When you cut out the lace for the patch, you can cut around the flower motif as you like it. It doesn't have to be a square patch, so take as many flowers as you like. I went with the largest flower motif as I thought it would blend the best in the area. Take the same not-too-tight whip stitch around the edge of the patch being sure to anchor to the thick part of the lace as much as possible, and being very gentle in the mesh parts. Tie off your threads and you're done! 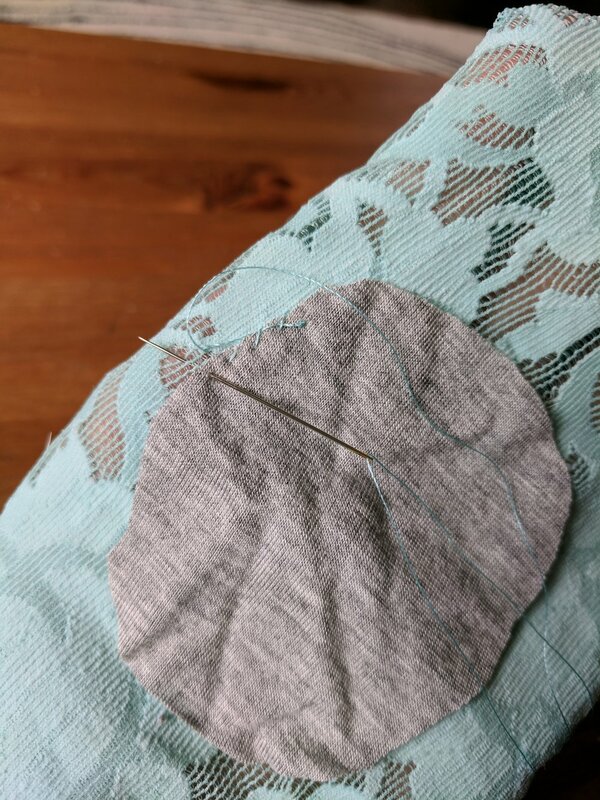 You can optionally run stitches through the middle of the patch to fuse the two layers together, but as this fabric is so stretchy, I'm not certain the thread wouldn't just break due to lack of stretch, but if you're feeling bold, go for it!